You are here: Home / Organize / By Space / Garage / IS GARAGE ORGANIZATION ON YOUR “TO DO LIST” THIS WEEKEND? IS GARAGE ORGANIZATION ON YOUR “TO DO LIST” THIS WEEKEND? According to a recent survey of homeowners, 25% of homes with two-car garages don't park any cars in their garage. The purpose of a garage is to protect your vehicle (typically one of your largest investments) from the elements, but instead, many of us tend to view the garage as a dumping ground for clutter. What a great reason to make garage organization a priority on your "honey do" list. The Saturday following Labor Day has been earmarked as National Clean Out Your Garage Day, which serves as the perfect opportunity to roll up your sleeves and tackle this often-neglected space. Are you shuttering at the idea? Perhaps a bit of visual inspiration (mixed in with a few helpful tips) will serve as the motivation you need to complete your garage overhaul during the weekend (so that you can finally reclaim your parking space. 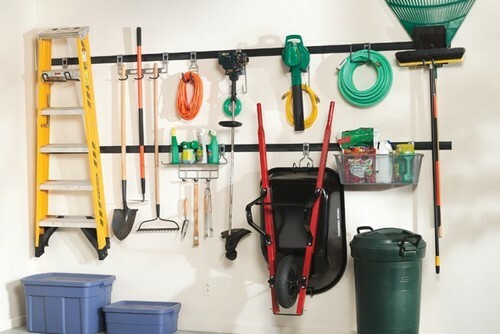 This image illustrates another primary rule of thumb for organizing a garage — create zones for the various types of items that you store in the space. For instance, most garages will have a Lawn & Garden zone and a Tool Zone. Other typical zones might include Sports Equipment, Kid’s Toys, Car Care, and Chemicals/Paint. Agree with everything here. Especially like the tip of using plastic bins instead of cardboard… makes sense. Good tips, and overall nice blog with your other organization/productivity posts as well!